A new school year has just started, new students have just arrived – what about new teachers? Are there a lot of new faces in the staffrooms? One of the stories frequently told about schools serving poor communities is that they suffer from very high and damaging staff turnover. Few teachers stay a long time, and, relative to schools in the affluent suburbs, there is a constant ‘churn’ of staff. This lack of experienced teachers reduces the chances of new teachers learning the trade on the job, and means that both students and school leaders are forever coping with new names, personalities and teaching styles. Is this true or urban myth? For the first time, we can start to answer this question systematically, moving beyond a collection of local anecdotes. New data collected from all schools about their workforce has the potential to hugely improve our understanding of teachers and teacher labour markets. We use this data to analyse the length of time that teachers stay in schools, i.e. their job tenure in a particular school. This is the form in which the problem faces headteachers: how many novices do they have, how many veterans and so on. While there is a good deal of research on teachers leaving the profession as a whole, the issue here is how long teachers stay in a specific school. Like many urban myths, there is a hint of truth in this view that deprived schools experience greater teacher turnover, but not much. Averaging over all teachers, the mean time in a school is 6.7 years. Here we need to introduce a technical issue. The data come from teachers in schools, so this is job tenure so far, elapsed tenure. Obviously, a teacher who has just arrived at a school may go on to spend the rest of her career there. Under certain circumstances, the statistical model implies that the average completed tenure is double the average elapsed tenure. 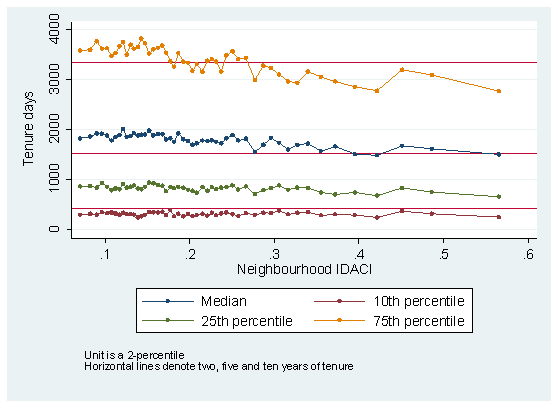 That is the overall picture, what of the differences between disadvantaged and affluent neighbourhoods? We find systematic and statistically significant differences in turnover: schools with many poor pupils do have more short-tenure teachers and fewer experienced teachers. However, on average the differences are small: 18% of teachers in the least disadvantaged schools have tenure of 0-2 years, compared to 22% in the most disadvantaged. At the other end of the scale, 20% of teachers in schools in the most affluent neighbourhoods have tenure of at least 10 years, whereas the figure in the most deprived neighbourhoods is 17%. Figure 1 gives a flavour of the results. It shows the 10th percentile of tenure in school in days (the lowest line in the figure), across the full range of communities in England, from the richest 2% in the far left-hand side point to the poorest 2% in the far right-hand point. The 10th percentile comes out at somewhat less than two years, but more interestingly, is flat. The number barely changes across the entire distribution. There is a very slight slope in the 25th percentile and in the median values, reinforcing the point that there are systematic differences but that they are quantitatively small. There is a more noticeable difference in the 75th percentile: in schools serving poor communities, there are slightly fewer experienced teachers. We also use the richness of the data to decompose the relationship between turnover and poverty. We show that part can be accounted for by pupil characteristics, perhaps because students in schools in more deprived areas are harder to teach. Part also is accounted for by differences in the local teacher labour market around each school. Controlling for school, student and teacher labour market factors reduces the association between school poverty and turnover, but does not eliminate it. The remaining association between teacher turnover and poverty is largely accounted for by teacher characteristics, with the poorer schools hiring much younger teachers on average. How should we understand this? We interpret this as either deriving from the preferences of young teachers, or as reflecting the low market attractiveness of disadvantaged schools. There are a number of possibilities. First, it could be that this is a desired career path for young teachers. New teachers may look for their first jobs near to where they trained, which implies predominantly urban and therefore on average deprived, schools. Alternatively it could be a desired career path deriving from younger teachers possibly having more idealistic preferences, and welcoming the opportunity to work in deprived schools. Under these interpretations, the allocation reflects the desire of younger teachers to work in deprived schools, and the higher turnover in such schools derives from this. The alternative interpretation is a matching story in which the more effective teachers sort on average into the more affluent schools, and the disproportionate number of inexperienced teachers in the poorer urban schools reflects the realities of the market that these schools face. Distinguishing between these interpretations is a task for future work; it will need further sweeps of the data and possibly attitudinal data from teachers as well. It is now widely acknowledged that teacher effectiveness is the single most important factor in raising attainment. Attainment gaps arise in part from students’ exposure to teachers of differing effectiveness. The process by which different teachers end up at different schools in front of different children is little understood. We intend to spend the next few years utilising this new data to address this research programme. Reblogged this on Rebecca Allen.